Many of us are interested in learning more about our family. In fact, it has never been easier to find out about your family, and the more you dig, the more you’re going to uncover. Many people have started with a family tree that just seems to grow continually, and it can be amazing to see your roots and to learn more about where you came from. Although developing a family tree is an amazing experience, there are also some questions that you may have, especially when you’re starting out. One of those questions is in regards to exactly what part of our family people are. You don’t even need to go back very far in your family line to uncover the confusion, but this little article is going to help to clear things up very nicely. Fortunately, for you, you’re about to learn the truth about something that many people struggle with throughout their life. Some people consider it to be very important, and if you are somebody that loves learning about your family, you will appreciate it as well. I’m talking about understanding the difference between different types of cousins. 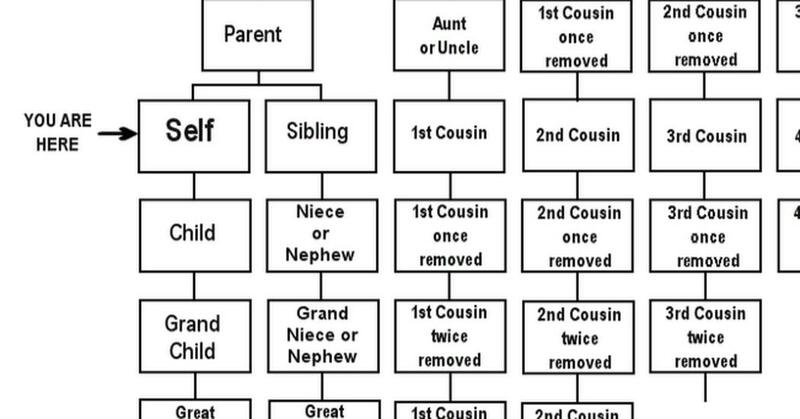 If you ever struggle to know who is your second cousin and who is your cousin once removed, this little chart is going to straighten things up. What Does Once Removed Mean? One of the more confusing aspects about understanding our cousins is knowing what the term, once removed, actually means. After all, we may have second or third cousins and all of us are in the same generation. It is only after you begin in other generations that the once or twice comes into play. Is your head spinning? Take a look at the chart and it will help you to understand. It can be difficult to remember that the children of our mother’s cousins are actually related to us. In reality, they are our second cousins and their children are also our second cousins, but there once removed. The children of the children of our second cousins are our second cousins twice removed. That should help to clear things up but even if you have any questions, you can always refer to the chart. This is a perfect conversation for a family reunion or for talking to someone about a family tree. When you get them on the subject, you will likely find that they have had some questions in the past as well. What’s the Big Deal about Genealogy? The fact that people have an interest in their family tree should really not come as a surprise. As humans, we are naturally curious and we want to know more about our past. Not only that, you may also find that understanding more about your past can help you to learn more about your future as well. At the very least, it can certainly help you to pass along something interesting to your children and their children.